This year, holiday tidings of “Joy to the World” and “Peace on Earth” may seem too much to hope for given the crises in Paris, Syria, the Middle East and closer to home. Many of us are feeling overwhelmed by world events and powerless to make a difference. Some of us feel as helpless as children. And therein, lies the possibility for grace—if we remember that children are far from helpless. When our adult problems seem impossibly huge, we can learn from children who innately know how to make a play for peace by powering up their curiosity, imaginations, courage and empathy through play. 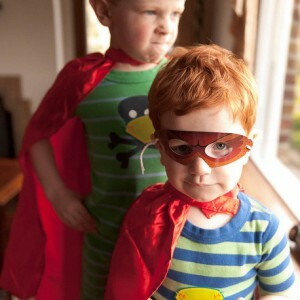 Do you remember invoking your inner superhero or heroine and using your powers in service of the greater good? You might have donned a cape to save the city (or your neighborhood) on your Schwinn. Maybe you built amazing fortresses out of Legos or pillows and blankets. Perhaps you created classic stories of good versus evil and then acted them out with your friends. Do you remember battling the bad guys? The imaginary ones and the not-so-imaginary ones that began to show up on the playground, in the classroom and in our parents’ worried faces? The most extraordinary super powers we possessed as children included our ability to laugh in the darkest of moments, to express love across vast divides, and to smile in the face of the most daunting odds. I was reminded of this recently when a friend shared a video of Clowns Without Borders, a troupe of merrymakers who have performed for more than 6,000 refugees from Syria, Afghanistan and Iraq. What is even more powerful is discovering our laughter can heal those we’ve never even met. Research shows that happiness is contagious and can have a positive impact that extends up to three degrees of separation. That’s world peace one joyful laugh (to the power of 3) at a time! This is one of my favorite quotes from author Anne Lamott, and it reminds me of another secret “weapon” in the playful peace movement. A few years ago, I met someone who offered some unusual aid in the devastating aftermath of Hurricane Katrina. It took a few days for my friend Tom to arrange time off from work. By the time he was able to go, relief agencies no longer needed help distributing life-saving supplies like food and water. Undeterred, Tom went to a local dollar store and roamed the aisles looking for some kind of Divine sign. Amazingly, he found it. Tom remembered watching the news and seeing thousands of people waiting in staggeringly long lines just to get baby formula or a toothbrush. He knew he couldn’t make the lines move any faster. But maybe he could help make the waiting a little less agonizing. He packed up his compassion and hundreds of bottles of bubble juice and drove to New Orleans—emptying the shelves of countless stores from Virginia to Louisiana. What happened over the next few days was nothing short of magical and involved hundreds of hurricane survivors and a sky full of iridescent bubbles, each reflecting the childlike smiles of those who had reclaimed a few moments of joy and playful connection. More recently, I was delighted to discover the UK-based Bubbles Not Bombs campaign, which sends bubbles around the world to help children remember how to smile in places where smiles are needed most, like Greek and French refugee camps and the war-torn West Bank. But can superheroes, clowns and bubbles do more than just put a few smiles on our faces? Can play really be a path to world peace? Certainly these stories show how play can connect us with courage, perseverance and our joyful natures in the midst of challenging circumstances. But play also connects us with each other and with something greater than ourselves. Joy with a capital J. In his interview “Play, Spirit and Character,” with Krista Tippett for On Being, Stuart Brown, MD, explains how play naturally teaches children empathy, trust, problem-solving skills, appropriate risk-taking, and emotional regulation. Rough and tumble play teaches kids about boundaries and helps them develop compassion. 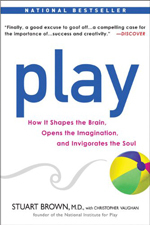 In other words, play builds character, something that Brown saw again and again in his research spanning more than four decades and 6,000 play histories. Think this is too bold a claim? We challenge you to put it to the test! 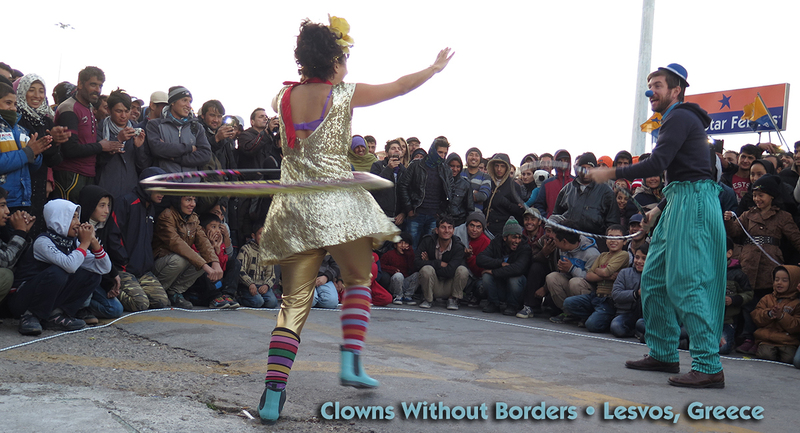 Photo credits: Lesvos, Greece 2015, Clowns Without Borders, Sick Superheros by Brian Dewey | CC BY-NC 2.0, Bubble Battle: The Joy of Bubbles by Gene Han | CC BY-NC 2.0.